Small Towns Everywhere, USA My town was actually too small to be a town. We were a village. Three villages combined to create one high school so that we would have enough kids to have sports teams, and most of the kids were my cousins. At the time the world seemed so far away an out of reach. Classmates elected me, “Most Likely to Succeed.” In our school this translated to, “Most Likely to Get the Hell Out of Town.” Looking back, I wouldn’t have had it any other way. Growing up in that town with my family all around me gave me the security to go out and make my world whatever I want it to be. I know that it and they are always there rooting for me. Of course, they are also willing to give me a good smack if I get too citified. 😉 RM: What was your first job in high school?LS: The local ice cream shop was the place to be. I ate so much chocolate, ice cream, and popcorn that my face broke out. Acne is about the worst thing that can happen to a teenager so I was happy when summer ended and I could go back to school. RM: What is your current profession?LS: Becoming a famous fashion designer seemed like a good idea in college, but after about ten years in the business, I changed my mind. Fit modeling is a job where I can still be on the fringes of fashion without as much of the drama. I go from one account to the next trying on samples to make sure they are a correct and comfortable fit for production. This means that my body measurements cannot vary by more than ¼” from day to day. Each account has dress forms that replicate my body exactly so it is important that I stay the same size as the form. RM: What influenced your decision to set up a reef tank?LS: I bought gold fish, and they kept dying. Crazy reason to get a reef tank, right? Once I started researching tank cycles, I was hooked. Doing things by small measure has never been my strength so I decided to go straight for the big guns and set up a reef tank. RM: Is there a part about the hobby that you enjoy now that you did not expect when you first set up the tank?LS: The first forum post that I made in my life was on Manhattan Reefs. I didn’t have any idea that forums existed for hobbyists. The sense of community that exists on these forums is really incredible, and I have made some terrific new friends through reefing. RM: How much does your boy friend B. Fishy help with maintenance?LS: Just the idea of certain bad smells nauseates me so he is in charge of emptying the skimmer. He also gives me a hand when there is any heavy lifting involved. After a year of water changes, I can pretty much lift a five gallon pail of water with no problem, but sometimes, it’s easier to get some help. RM: When was your last water change?LS: Yesterday. The chiller dumped a bunch of water on the floor. As the floor was already a soggy mess, it seemed like a great time to do a water change and make more mess! RM: You had the most interesting aquarium stand stories I’ve heard in a while. What’s your advice for those buying stands that are made in China?LS: Wood-boring beetles hitch-hiked a ride to the US in the wood of my stand. Mysterious little holes kept appearing. Then, we noticed little piles of sawdust on the floor. Finally, B. Fishy caught one of the bugs boring from the inside out. The manufacturer was reluctant to replace it until I mentioned the USDA. My advice would be that there are tons of talented people who can build you a custom stand. 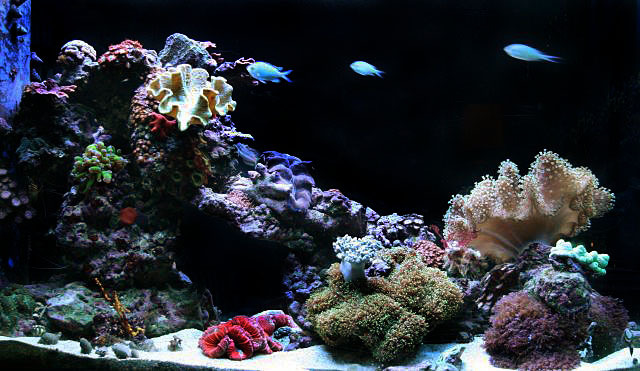 Most reef tanks have more equipment than will fit under a mass produced cabinet. It makes sense to spend a little extra early and save yourself the headache of not being able to buy that one perfect piece of equipment because it doesn’t fit under your tank. RM: What are your cats’ names?LS: Marvelous, Superfly, Lucky Neko, Jane, Lois, and Ulysses a.k.a P-Lush. Yes, that is a total of six. Fortunately, we have two bathrooms. 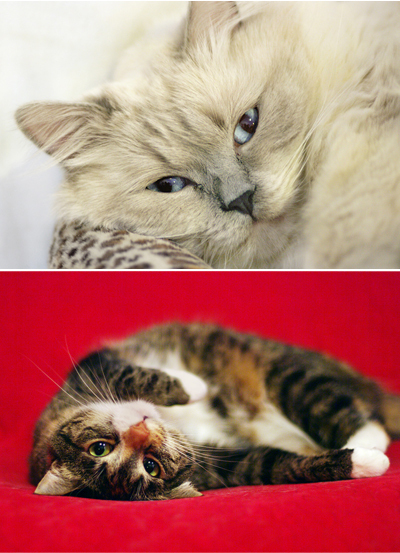 The cats share one, and B. Fishy and I share the other. RM: Do the cats enjoy the tank as much as you do? LS: They enjoy it way more than I do. 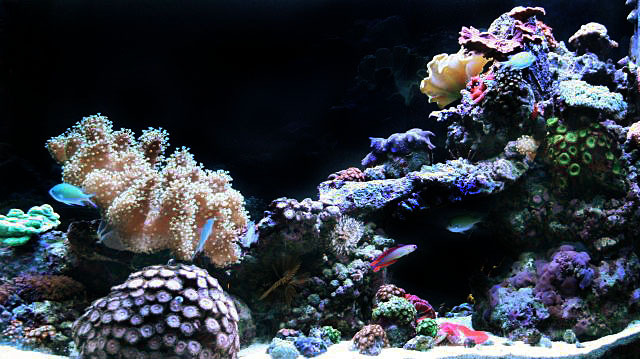 The tank provides hours of entertainment, the occasional fresh fish, and they don’t have to do any maintenance. RM: I’m curious, do you feel the hobby is geared more toward men?LS: There are definitely more men who keep reef tanks than women, but I wouldn’t say the hobby is geared toward men. If that were true, women would have a different approach to reefing than men do. That doesn’t seem to be the case. Maybe, men are more geared toward reefing than reefing is geared toward men. In general, men are definitely more into TV’s, stereos, cars, etc…I think that translates easily into chillers, lights, and skimmers. RM: You did a good amount of research before setting up the tank. Is there anything you would change if you could do it over again? Snowball the rainbow urchin. I have no idea why. He just looked like his name should be snowball. Big Clam and Fitty Cent. He’s ½ the size of Big Clam so he is only Fitty Cent. I’maguay the fire fish. U’raguay is MIA without a trace. Cat snack maybe?